Lou Gehrig might be the most beloved player in baseball history. He was certainly one of the best hitters to ever swing the bat and his unquestioned love of playing the game endeared him to fans around the world. This top list highlights the best Lou Gehrig baseball cards, including some of the most sought-after and valuable cards ever produced. Shop for Professionally Graded Lou Gehrig Cards on eBay. Gehrig's statistical résumé is among the greatest ever. The winner of the 1934 Triple Crown, his overall best season was in 1927 when he hit .373 with 47 home runs and 175 RBIs. That year would prove to be Gehrig's first MVP season and was followed by a second one in 1936. Gehrig was just as good during the World Series, scoring the game-winning run in eight World Series games. The New York Yankees won six World Series titles with Gehrig and three came while he was team captain. His popularity made him the first athlete to be featured on a Wheaties box and, after his retirement, he became the first player to have his number retired. Major League Baseball also created the Lou Gehrig Award, which is given to a player demonstrating integrity and character. 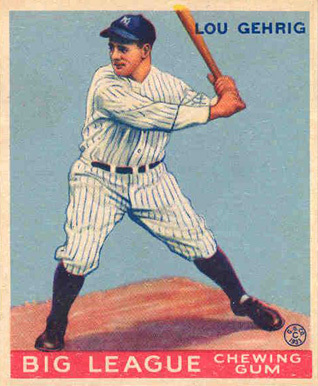 Long after his retirement, Gehrig continued to be regularly featured in Topps sets. Collectors can find cards honoring his consecutive-game "Iron Man" streak (1961 Topps), his friendship with Babe Ruth (1962 Topps), his record for most grand slams (1973 Topps), and his selection as an all-time All-Star (1976 Topps). He was also featured as the subject of the Hall of Fame Diamond Kings puzzle in 1985 Donruss. While his vintage cards are the preference for many, more Gehrig cards and parallels can be found in contemporary releases. 2007 Upper Deck Masterpieces includes a painted card of his retirement speech as well as many multi-colored border parallels. As a Yankee legend, Gehrig was prominently featured in the Yankee Stadium Legacy insert set that was found in multiple Upper Deck products in 2008. He was also included in the 2012, 2013, and 2014 Topps Allen and Ginter sets, giving collectors many opportunities to snap up modern Gehrig cards. With Lou Gehrig cards showing no sign of a decrease in popularity and value, many collectors will not be able to own his original cards. In building this top list, card value and design was the focus. It is important to note that even in sets with larger print runs, Gehrig's cards have become scarce because of the high demand from collectors. Are there any other Lou Gehrig cards that deserve a spot? Let us know in the comments. 1935 Schutter-Johnson features "Major League Secrets" as told by the star player on the front of the card. Cards for pitchers typically explain how to throw a certain pitch and batters give all sorts of tips on hitting, fielding, and running the bases. Gehrig provides batting tips which stress that right- handed batters should try to swing as naturally as possible and not try to drive the ball to the opposite field. The 1948 Swell Sports Thrills set contains 20 cards that honor some of the best moments in baseball history. 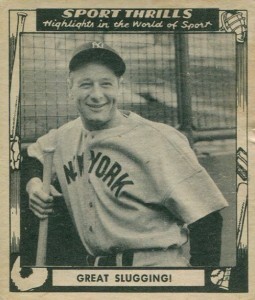 Gehrig's card details his "great slugging," as it states on the front of the card. A notable example of this is the fact that he became the first player in the 20th century to hit four home runs in a single game and did so against the Philadelphia A's in 1932. 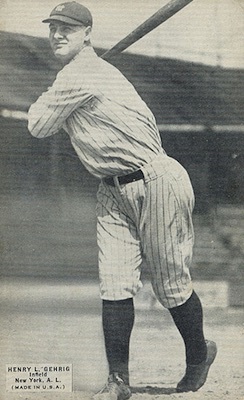 Gehrig also appears in the photograph on Babe Ruth's card, making it one of the most popular options in the set. One of the first releases from Topps was this 1951 set that featured Hall of Fame manager Connie Mack's selection of the best All-Stars to have ever played the game. There are only 11 cards to this die-cut product and Gehrig is selected as the best first baseman. 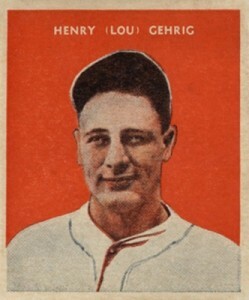 Although Gehrig's statistics make him more than qualified for Mack's selection as an all-time great, the reverse side of the card overstates his record. It mentioned that Gehrig won four MVP awards when, in fact, he actually only took home two MVPs. The large photocards from the 1934 Butterfinger set are more than double the size of standard cards today and are really closer to a poster than a typical baseball card. 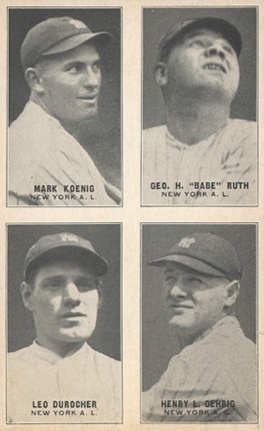 Gehrig's card, along with Babe Ruth, are the key appearances in the set and could be obtained through candy stores as a bonus when buying Butterfinger candy bars. Lou Gehrig relics or autographs in modern set are often considered amongst the best cards that box busters dream of pulling. These amazing cards are frequently produced in such small numbers that, unless you open many cases of a product, you have little hope of pulling them. There have been a few sets, however, that feature a more moderate number of jersey or bat relic cards and can be found at prices much lower than his original cards from his playing days. The Leaf Certified Materials Fabric of the Game set is one of the more reasonable options. You might expect that in the 1934 Goudey set, which is famous for having Gehrig providing commentary for the other players, Philadelphia Phillies outfield Chuck Klein would provide Gehrig's commentary as he also was featured on cards in the set. 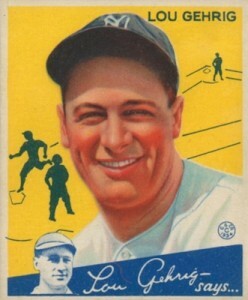 However, Gehrig also handles the information on his own card as he discusses his good fortune during his career. Yet, just four seasons later, he would be forced to retire from his health concerns. 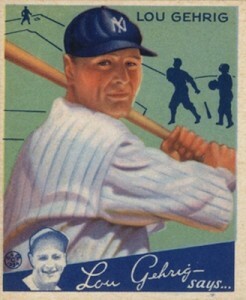 Another card for Gehrig (#61) can also be found in the set and it features a green background. While there are several different Exhibits Four-On-One cards featuring Gehrig alongside other Yankees, the ones in which he is teamed with Babe Ruth obviously hold the most value. The reverse side of these cards were intended to be used as a postcard and collectors can find several different color variations. 1933 U.S. Caramel is one of the most beautiful sets thanks to its simple design, but it is also an example of some of the worst practices by card makers of the time. If collectors could complete the set, they could turn them in to receive a glove and baseball. However, the makers of the cards short-printed card #16 to limit the number of prizes that could be claimed. When I say short-printed, I mean that only a few copies of card #16 have ever been found. Like many other sets that Gehrig appears in, his card only trails Babe Ruth as far as value. Viewed by many as his true rookie card, the 1925 Exhibits Lou Gehrig is quite scarce and slightly overlooked by collectors. 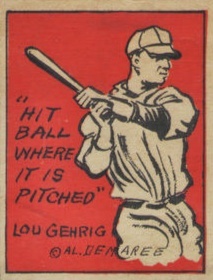 Basically just a black-and-white photo with a small text box in the corner, this early Gehrig card has a blank back. The limited availability of the 1933 DeLong set keeps this Gehrig card from reaching the #1 spot on the list. 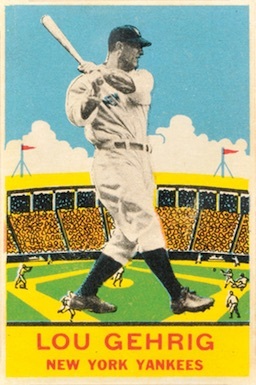 Regardless, Gehrig's card is certainly the top card of the entire set, if not one of the most sought-after cards of the 1930s, with its value many times more than any other card in the release. As fans of 1933 Goudey may already know, several of the biggest stars in the set have multiple cards. Babe Ruth, for example, has four separate cards. Although Gehrig is featured on two different cards numbers, both cards have identical fronts. The two cards are also commonly considered to be his rookie cards. Collectors have found that the second appearance, card #160, is the rarer of the two and so that card is held at a premium. 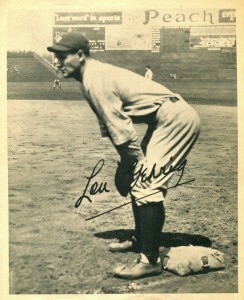 Lou Gehrig is my favorite player of all time. In 2003, I purchased a single box of Elite and pulled a Gehrig/Ruth Back2Back Jacks numbered to 50. Probably my most exciting pull ever, even if I’ve hit more valuable stuff before. 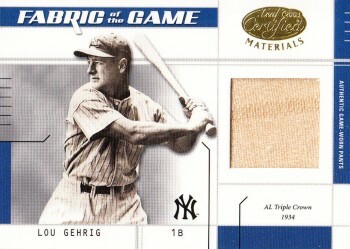 Then, in 2004, I purchased another single box of Elite and pulled a Gehrig Throwback Threads jersey numbered to 100. They are easily my favorite cards in my collection even though I have a number of things worth more. Grabbing two game-used gems of my idol in back to back years as someone who couldn’t afford to bust too much product is the highlight of my collecting career. I didn’t see it on your site , I hav one in my possession just wondering if it has any value?